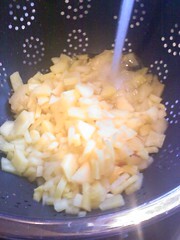 Are diced apples for Toddlers or Adults? 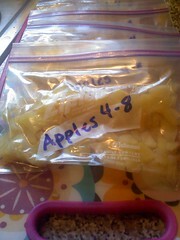 Battered and bruised apples are now frozen diced apples for my toddler. 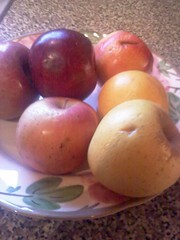 Several years ago, I would have thrown away these mushy, bruised, shriveled looking apples, thinking they were inedible. Today, I’m always thinking creatively in the kitchen. 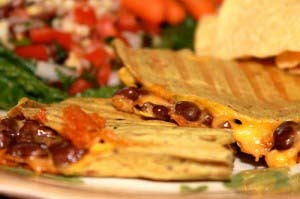 What can I do with this unappetizing food to make it more appealing? In today’s economy, this is beneficial to my pocketbook. 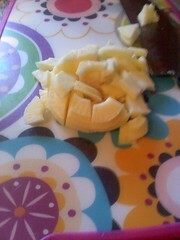 I have a handy dandy slicer/corer, peeler for apples. I can’t live without this kitchen tool. I use it every day during apple season. I can’t tell you the number of hours it has saved me in the kitchen. You can usually find these for less than twenty dollars at Bed Bath and Beyond with a coupon. I found this one at an outlet for ten dollars, no coupon. I snatched two and gave one away as a gift. They suction to your counter, they peel, core and slice at the same time. I love it. 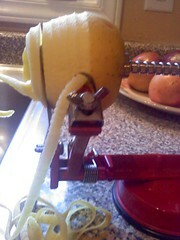 I started with this tool on my poor apples. Most made it through the process, but the mushier ones I had to hand peel to get the rest of the skin off. Then I dice into cubes for the toddler. Imagine the Gerber diced apples in a jar. That’s what I was aiming for. 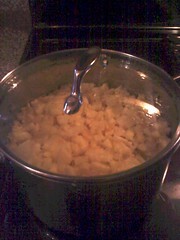 I brought the apples to a boil with a lid on my stove. I didn’t want to overcook the apples so I kept a close eye on these. I reduce the heat once to simmer once they boil. I’m going to cook only until fork tender, about ten minutes. Adjust your own time depending on the number of apples you are cooking. I don’t want these to be mushy. I shocked them with cold water and rinsed in the colander. After they were fully cooled, I spooned (with a 1/2 measuring cup) into a pint size labeled freezer bag. My friend uses snack sizes bags, and some moms have leftover disposable bottle bags, which would work too. I place them on my freezer inventory and lay flat in the freezer. These will thaw for twenty four hours before serving to the toddler. Drain well and sandwich between crescent dough and bake homemade apple pies. Do you have any banged, bruised or mushy apples begging for re-purpose? What will you do with your frozen diced apples? 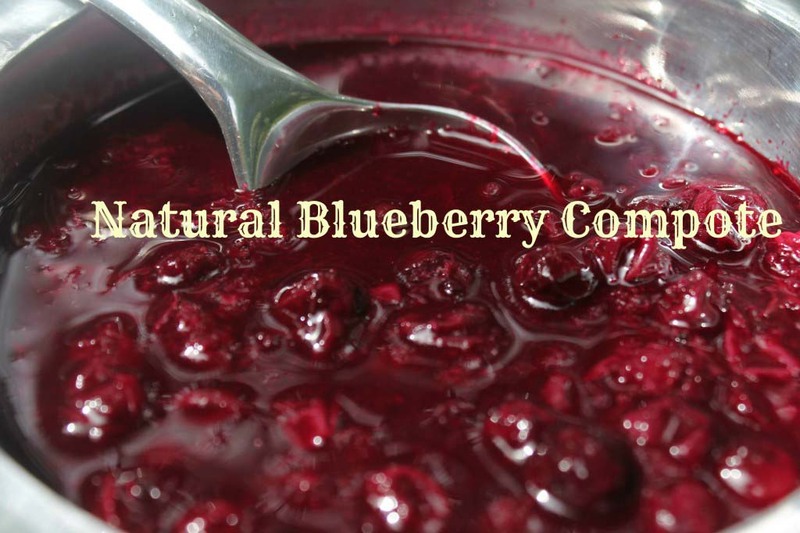 This entry was posted in Vegetables + Fruits and tagged freezing cooked apples, how to freeze apples, how to make your own diced toddler apples on 12.04.2011 by admin. I have had this same problem. So when I buy a bag of apples. I wash them, let them completely dry and store them in the frig. They last so much longer in there.